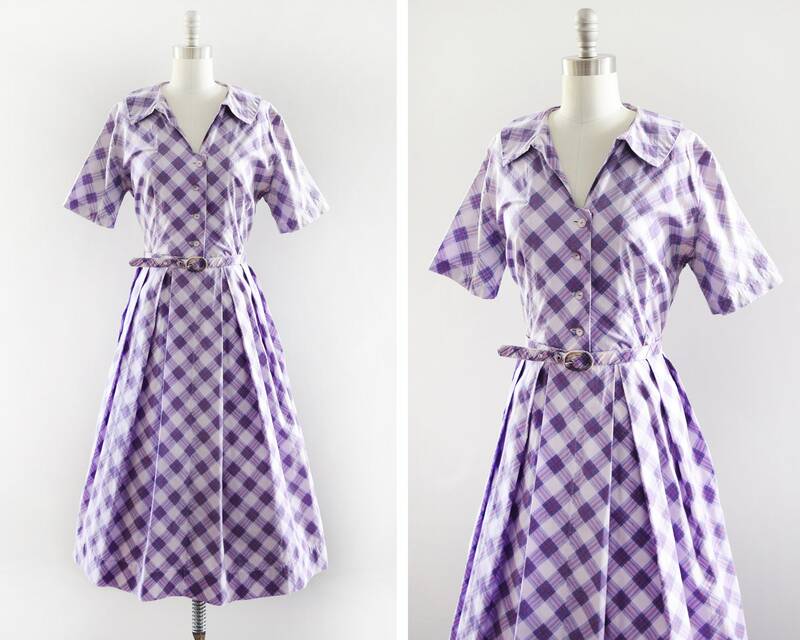 Cute vintage 1950s day dress. Various shades of purple, pink, and black plaid. Collared neckline with button up front and short sleeves. Fitted waist with matching belt. Metal zipper on the side. Full pleated skirt. The dress is was photographed with a crinoline slip that is not included. Since this dress is over 60 years old, there's a few issues. There's some yellowing on the left underarm, along with a color change under each arm (from purple to blue) that didn't come out during cleaning. The belt is discolored on the buckle and a few small spots on the rest. Also, there's some miscellaneous stitching on the sleeves and waist. I believe the dress is handmade, so this might be why some of the stitching is more noticeable. Please see photos. Price reflects these flaws.